More than just a date. When I first heard rumours of a Zeitwerk with date last year, what came to mind was a digital watch with oversized, digital date. 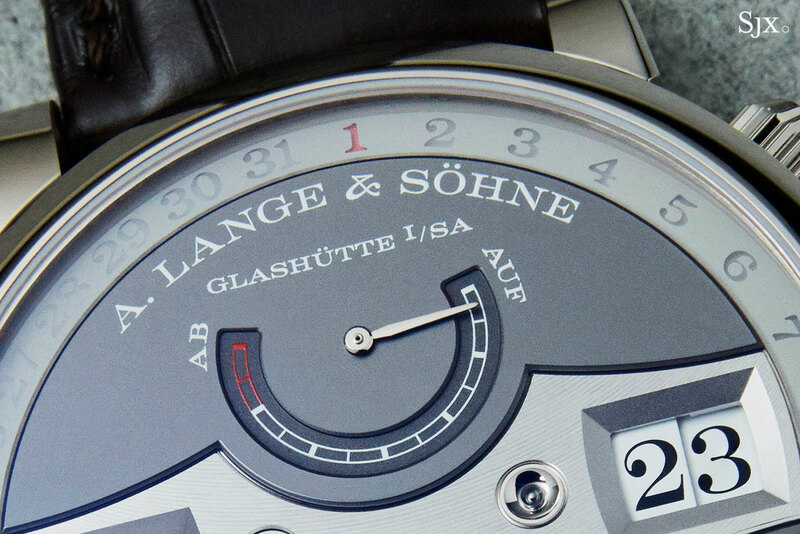 But when A. Lange & Söhne unveiled the Zeitwerk Date at SIHH 2019, it was not to be. The date took the form of a peripheral ring on the dial. I was slightly disappointed, but that was short lived, because the Zeitwerk Date is an impressively engineered improvement to the original, which is arguably one of three iconic Lange watch designs, along with the Lange 1 and Datograph. The original Zeitwerk is a compelling watch, but suffers from two key shortcomings, namely the short power reserve of just 36 hours, and a relatively thick case. The Zeitwerk Date fixes both of that with a movement that’s been improved with intelligent and complex engineering in a manner that’s typical of the brand. Even the construction of the pushers, which are almost an afterthought most of the time, is elaborate. 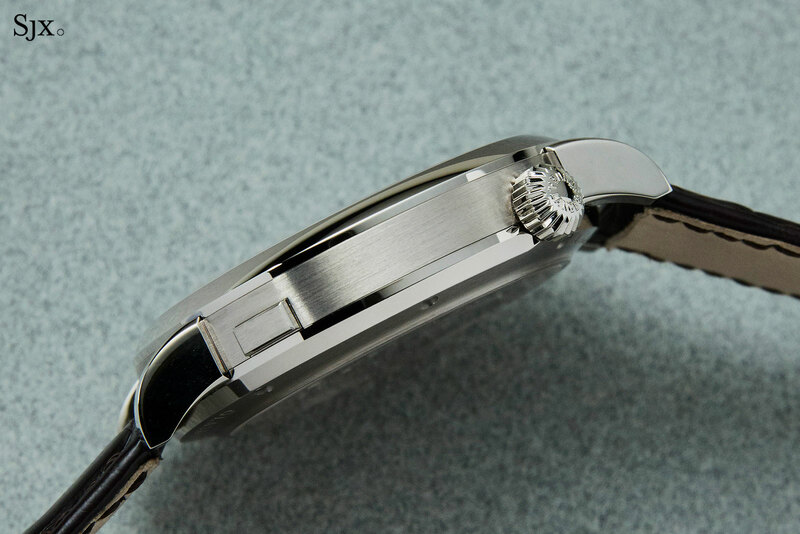 The Zeitwerk Date measures 44.2mm in diameter and 12.3mm high, making it wider but slightly slimmer than the original (which is 41.9mm by 12.6mm). Though the height reduction is negligible, the increase in diameter changes the proportions of the watch significantly. The Zeitwerk Date feels quite a lot slimmer, and not that much bigger, although it is physically a big watch. Enlarging the watch was not merely a cosmetic exercise. One obvious reason was to accommodate the date display, which is simple but smart. It sits on the perimeter of the dial, taking the form of a glass disc with the current date highlighted in red from underneath. The date ring serves to frame the digital time display without obscuring any part of the dial, which remains the original Zeitwerk design with its distinctive wing-shaped bridge. Ironically the date is the least interesting aspect of the Zeitwerk Date from a technical perspective. That distinction instead goes to the extended power reserve. The original Zeitwerk with its cal. L043.1 had a power reserve of just 36 hours, which means the watch can’t be left unattended over a weekend. 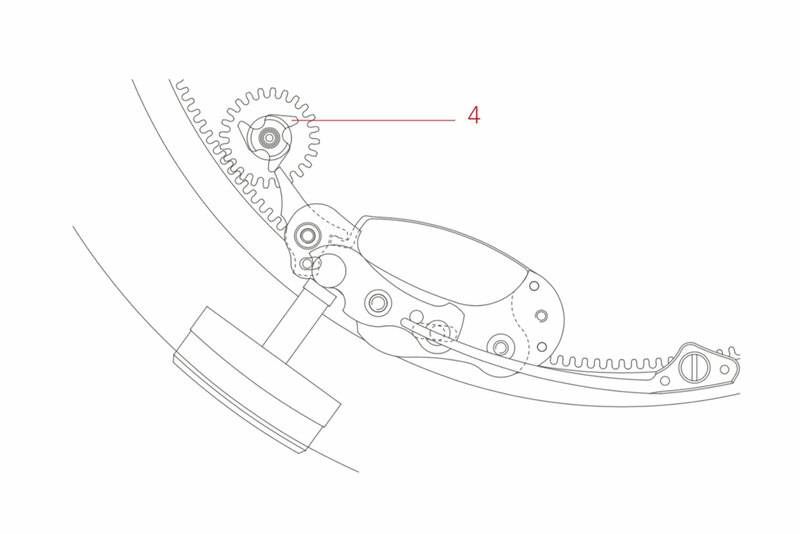 The L043.8 movement inside the Zeitwerk Date, on the other hand, doubles that to 72 hours, or three days. 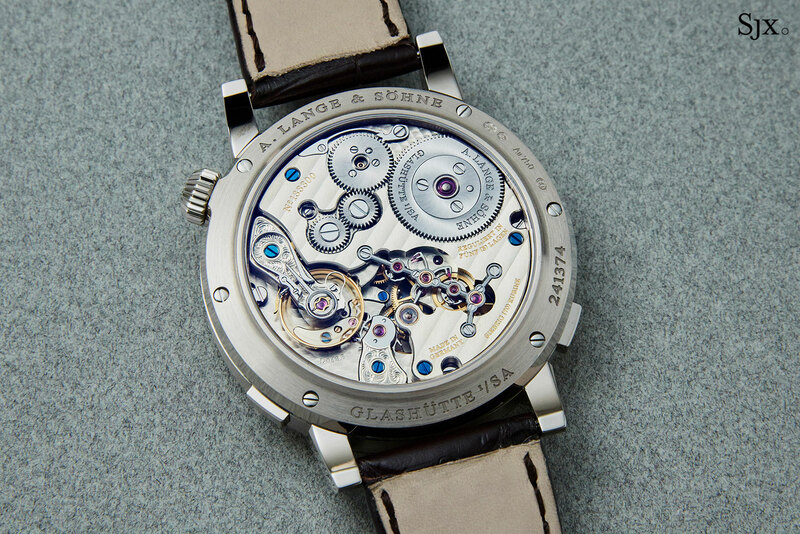 To accomplish that the movement went from having a single broad and fairly long mainspring to have two, as explained by Max van Aalst, a watchmaker who is now the International Academy Trainer at Lange. The L043.8 of the Zeitwerk Date relies on two stacked barrels (with the top one being a floating barrel), each containing a mainspring that’s almost identical in length to that in the original, but slightly narrower in width. For comparison, the single mainspring in the original Zeitwerk is about two-thirds the height of two stacked mainsprings from the Zeitwerk Date. The two mainsprings also unwind in parallel, or simultaneously, providing fairly constant torque throughout the entire power reserve and also eliminating the Maltese cross gears found on the barrel of the original Zeitwerk movement. But the improved power reserve is also a consequence of less power being required to wind the remontoir spring and oscillate the balance wheel. The remontoir spring is thinner, while the balance wheel is lighter. According to Robert Hoffmann, the watchmaker in charge of the Zeitwerk department, the energy required to wind the thinner remontoir is several degrees of magnitude less than before. Each rewinding of the spring only leads to a five degree drop in balance wheel amplitude, as compared to 35 degrees in the original Zeitwerk movement. The constant force mechanism has also been face-lifted, though it operates in the same manner. The original Zeitwerk movement had an anchor-shaped remontoir bridge with a kink at its end, which was the only ugly element of the movement. Now the remontoir bridge has been refined, becoming perfectly linear and also slimmer for a more streamlined look. But the most intriguing element of the new Zeitwerk are the pushers for the date and hours. The button at eight o’clock advances the date forward, while the button at four o’clock advances the hour display by one hour. The rationale for the latter is to eliminate the hassle of scrolling through multiple minutes and hours when setting the time, as it was on the original Zeitwerk. While conventional pushers, like those for operating chronographs or Lange’s trademark date display, do the job when depressed, the buttons on the Zeitwerk Date work in the opposite manner, executing upon release of the button. That’s because both pushers rely on an all-or-nothing clutch mechanism. 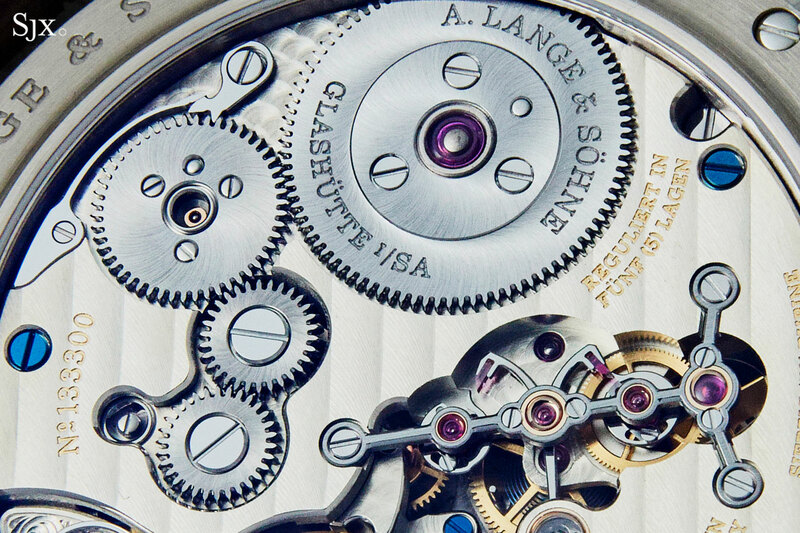 According to Tino Bobe, Lange’s factory head, the pushers arm a clutch spring when depressed, and when the pusher is released, the spring jumps the display. One advantage of this construction is a constancy in the jumping mechanism. Because of jump is triggered by a clutch spring and not direct pusher action, the jumping impulse is always identical regardless of how hard the pusher was depressed. The reason for the unusual pusher setup is the decreased real estate available within the watch case, as a result of the wider movement. 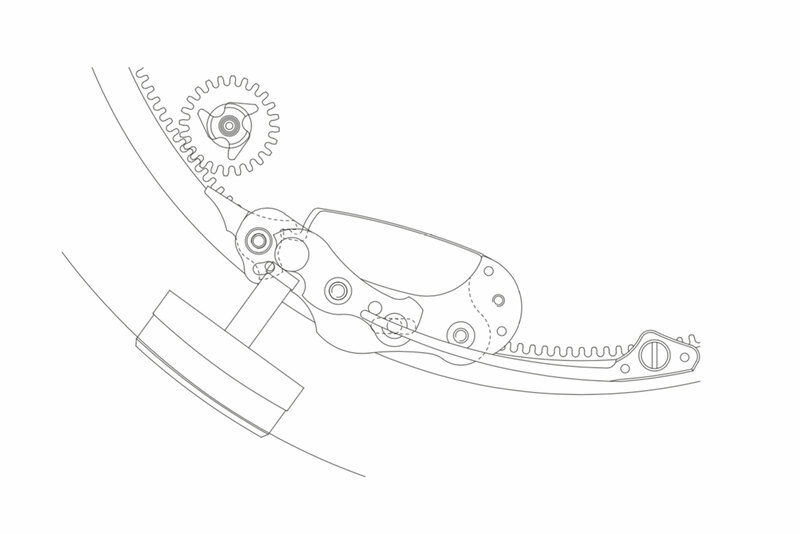 A conventional pusher mechanism would have had the activation lever sitting uncomfortably close to the movement. That would mean potential damage if the pusher was pressed too hard, or accidental activation with the slightest touch. Though the additional features of the Zeitwerk Date appear straightforward, the movement is significantly more complicated. The L043.8 inside is made up of 516 parts, compared to just 388 inside the L043.1 of the original Zeitwerk. Mr Bobe says that final assembly (which excludes initial assembly and finishing of parts) of the Zeitwerk Date movement takes about 20% more time than the original Zeitwerk. So although the Zeitwerk Date is priced at about a quarter more than the original Zeitwerk, or €89,000 against €71,500, the premium is justified in many tangible ways. And according to Mr Hoffmann of the Zeitwerk department, there are no immediate plans to incorporate the movement upgrades into the original, time-only Zeitwerk. Winding the watch via the crown winds both mainsprings simultaneously. And the mainsprings also unwind at the same time, or in parallel, as the watch is running. 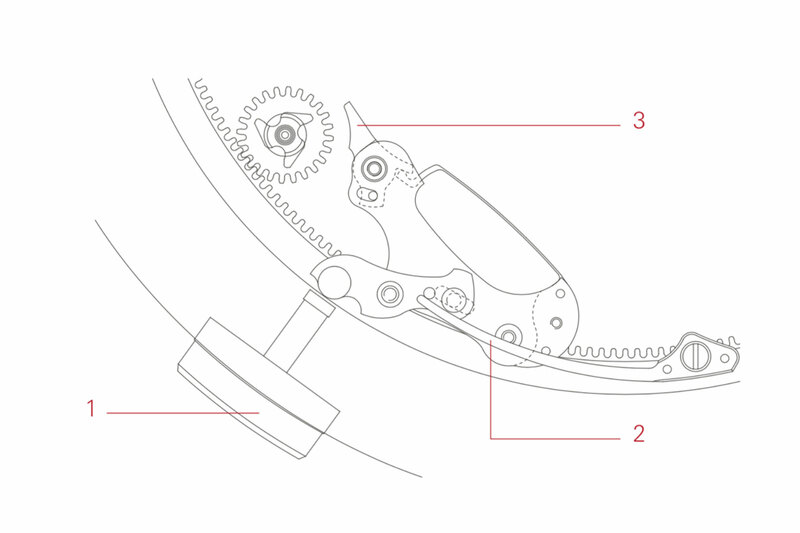 The mainsprings are connected via the upper barrel core (1) and the lower barrel drum (4), which allows the floating upper barrel drum (3) to rotate at twice the speed of the lower barrel drum (4) when the watch is being wound. When the watch is running, the opposite is true: the lower barrel drum (4) rotates at twice the speed of the upper barrel drum (3). Consequently, when the barrels are unwinding, they are supported by the lower jewelled bearing and the lower barrel core. 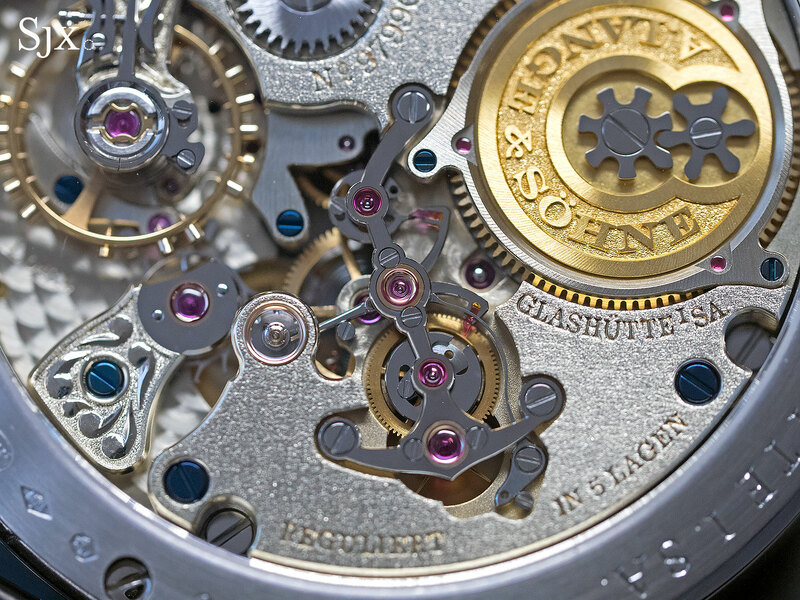 This construction means the greatest friction is generated when the watch is being wound, while minimising the friction when the watch is running and the barrels are unwinding. That maximises the power reserve by optimising the use of energy when the watch is running. The date setting mechanism was constructed to ensure the date is advanced by one, or not at all, even if the date pusher is only partially depressed. That’s because mechanism is driven by a spring that’s tensioned by the pusher, in contrast to a conventional date mechanism that relies on the pusher directly advancing the date. When the pusher (1) is depressed, the spring (2) is lifted outwards towards the pusher and tensioned. This activates the lever system, which ends in a pawl (3) that is movable in one pivot direction but fixed in the other direction. With the button partially depressed, the pawl moves outwards towards the pusher, in the direction where the pawl is movable. The pawl glides over the corrector star (4) towards the tip of the star. When the button is fully depressed, the pawl is past the tip of the star and is clear of it. As the button is released, the spring releases and triggers the lever system. That in turn brings the pawl back, and the pawl travels in the direction where it is fixed. The pawl contacts the tip of the star and continues pushing the star backwards, away from the pusher. 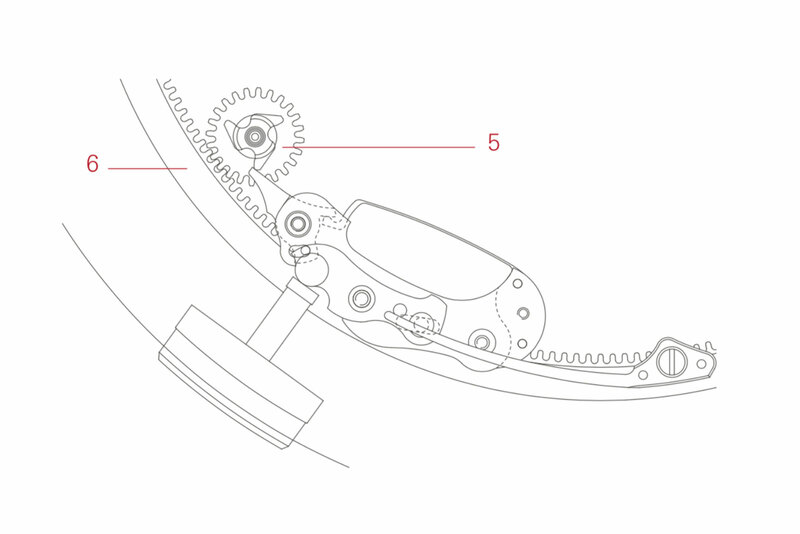 This turns the star by one step, turning the date pinion (5) and the date ring (6), advancing the date displayed. 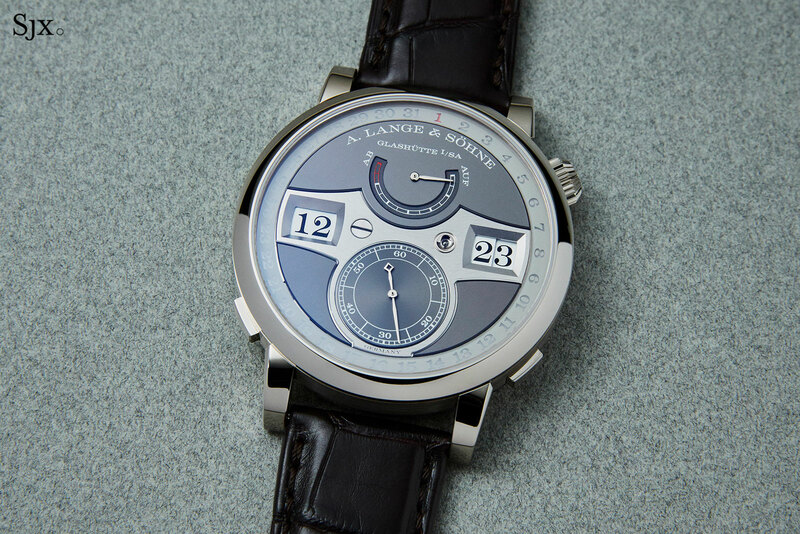 Technical diagrams courtesy of A. Lange & Söhne. Amendments January 17, 2019: Added detail as to the benefit of the thinner remontoir spring. Addition February 13, 2019: Addendum covering the date pusher mechanism and twin barrels.